Employers are also responsible for the health and welfare of their workers. When an employee calls in sick, bosses are often skeptical, especially if the caller has exceeded his allotted sick days for the year. Most do not consider the possibility that it could be something at the office that is making folks ill.
As long as oxygen and moisture are present, mold can grow on just about any organic substance, from fruit to wood or sheetrock. 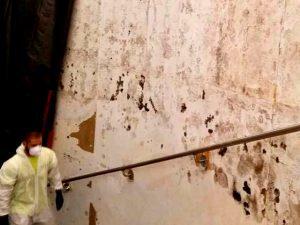 Mold grows unchecked in thousands of office buildings, warehouses, and medical facilities. Even when present in large quantities, mold colonies may have little to no effect on workers. But when the person is allergic to mold spores, they will invariably suffer the symptoms of an allergic reaction, which can range from mild to severe. The more the employee is exposed to the allergen, the sicker he will get. Common symptoms include itchy, watery eyes, coughing, sneezing, headaches, and respiratory problems. As mold continues to grow, which it will in the right (or wrong) environment, these issues will only be exacerbated. It goes almost without saying that most business owners/bosses are self-starters. These highly motivated individuals don’t mind rolling up their sleeves and getting their hands dirty every now and then. As a result, most of them like to handle things on their own. While this persistence often works to their advantage, it can occasionally be a drawback. When a job requires a trained technician, it should not be attempted by an amateur. The results could be costly! Like most allergens, when people who have a sensitivity to mold inhale it, their bodies react in a negative way. Trying to clean a visible mold colony without the right equipment is the rough equivalent of kicking a hornet’s nest. Once disturbed, most of the mold spores will take flight and become airborne, which will only make the problems worse. Not to mention the fact that the entire affected area must be properly and professionally treated, or else the mold will simply return in as little as one day! Our team of experienced professionals has dealt with mold infestations in residential and commercial locations in Palm Beach such as offices, medical facilities, warehouses, and retail stores. The equipment and techniques they utilize are designed to protect the health of the occupants of these structures above all else. Removing mold can also eliminate or at least limit the need for expensive future repairs. What Do Our Mold Technicians Do? Without getting too technical, their job is to remove the mold and then to clean and treat the affected area with a number of commercial-grade mold killers and removers. Whether it takes minutes or several hours, our experts address the issue by extracting the mold and making sure that it cannot grow again. This may include altering the environment to reduce the moisture levels, which is what allows mold to gain a foothold. In cases of serious infestation, they may install additional ventilation. Commercial Mold Remediation Crews Ready 24 Hours a Day, 7 Days a Week.